Carne asada are grilled thin steaks marinated with garlic, cumin, salt and pepper. You can find the meat already sliced thinly at some grocery stores, you can also ask someone in the meat department to slice the meat very thinly for you. Another option is to buy thicker cuts of meat, freeze them slightly and then use a very sharp knife to cut the meat into thin slices. You can also make this dish using thinly sliced fillets of pork or chicken. 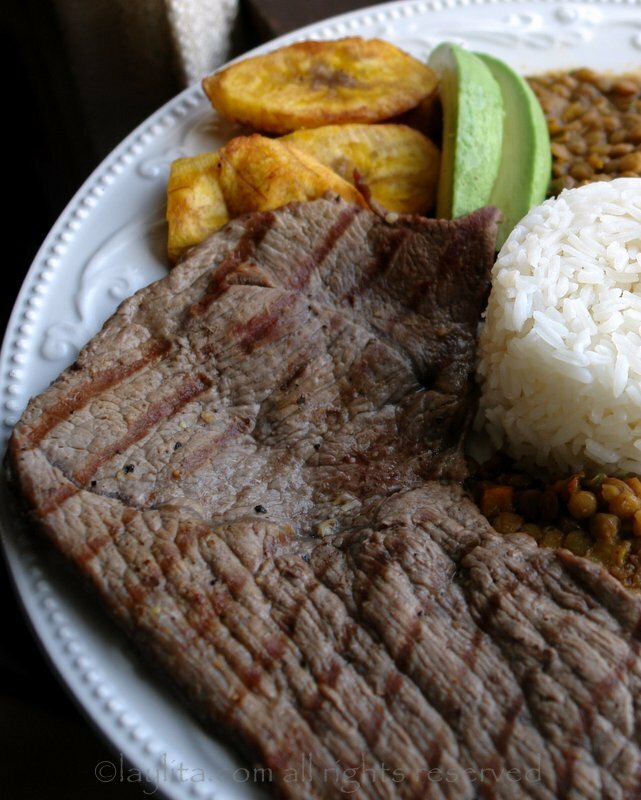 In Ecuador, carne asada is usually served with side dishes like rice, menestra de lentejas or lentil stew, fried ripe plantains, avocado slices, and a small salad. 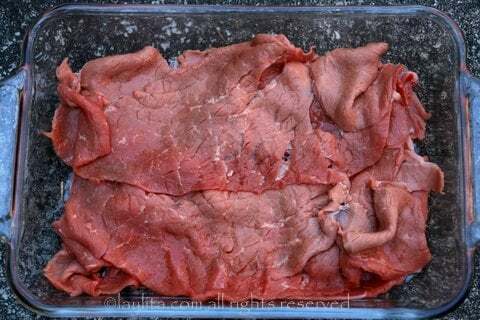 Carne asada are grilled thin steaks marinated with garlic, cumin, salt and pepper. Mix the garlic, salt, cumin and pepper to make a marinade paste. Season the steaks with the garlic paste and let rest for at least 30 minutes, overnight is ideal. Heat the grill and cook the meat, make sure the garlic bits are removed from the meat before grilling to avoid burning. The steaks are so thin that they cook very quickly. Serve with rice and menestra, or your choice of side dishes. 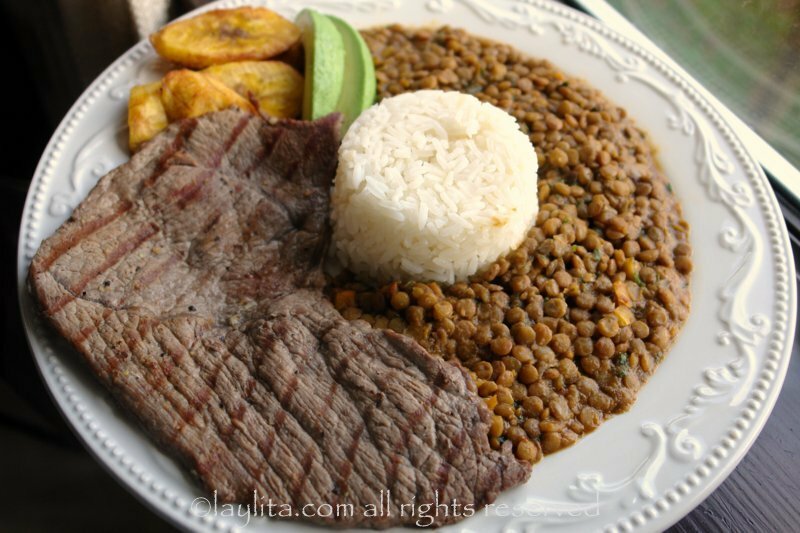 To make carne frita or fried thin steaks, heat a few tablespoons of oil or butter in a frying pan and cook the meat over medium high heat on each side. This is the second time I made this recipe, and it was awesome! I used 1 3/4 lbs of thin cut petit sirloin steak. To begin, I sliced up a half a green pepper, a half a red pepper and a medium onion, then stir fried them in peanut oil in a hot, heavy fry pan sprinkling them with one tsp. of garlic granules, 1/2 tsp each of salt, pepper and cumin. When they began to caramelize, I removed them and put them in a toaster oven set on warm. Meanwhile, I grated 6-8 cloves of garlic, and set it aside. Then I measured 2 tsp of salt, pepper, and cumin into custard cup. I removed the steaks from the refrigerator, rubbed them on both sides with the grated garlic and sprinkled the spice mixture on both sides. I put the meat in the pan that cooked the onions and peppers (still hot) and heated until they were beginning to get well browned on each side. To cook all the meat I had, I repeated the last process three times, adding peanut oil as necessary. The result was fabulous, and it all took less than an hour. Delicious!!! Thanks Laylita!!! 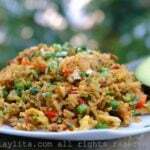 Laylita loveeeee your recipes, Im ecuadorian living in Tx. Question what kind of steak should I get for la carne asada? Gracias!! Carne asada is usually a round top cut. Oh heavens, I just found you and your recipes…after looking at them for an hour I am ready to eat my phone!! Tomorrow Carne Asada and Cerviche!! This is a great resource, can’t wait to start making All of these!! 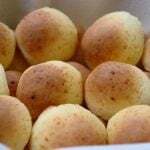 I am new to Ecuador, 3 months, and was having trouble preparing meals for my Ecuadorian husband, I am Canadian, until I found your site. Wonderful recipes. They are easily understandable with ingredients that I can purchase locally. Today I prepared minestra de lentijas,carne frita and patacones. I just followed the instructions to the letter and loked at the pictures to clarify any hesitation. My husband is over the moon at my “expertise” in the kitchen. Thank you Thank you Thank you. No need to look anywhere else for good home cooking recipes.